Can I Apply for Citizenship if I Owe Back Taxes? This is a question that comes up often for permanent residents looking to apply for citizenship. Will Immigration allow a person to naturalize even if they owe back taxes? Typically a person is otherwise eligible to naturalize but they owe back taxes, either because they couldn’t afford to pay or (more often) because of a mistake on their past taxes. The Form N-400 asks if the applicant owes any back taxes. And the issue of refusal to pay one’s taxes can show bad moral character (good moral character is required for naturalization). So, can you apply for naturalization if you owe back taxes? The answer is definitely “yes,” but there are several things you must do first. Obviously if you can pay the taxes, then pay them. I hear often that a client’s accountant has advised them to pay over time (so that they can keep drawing interest on the money rather than give it all to the IRS at once). That might make good accounting sense, but it doesn’t make sense if you’re applying for citizenship. The only way to naturalize while you owe back taxes is to enter into a payment plan with the IRS, also called an Installment Agreement. 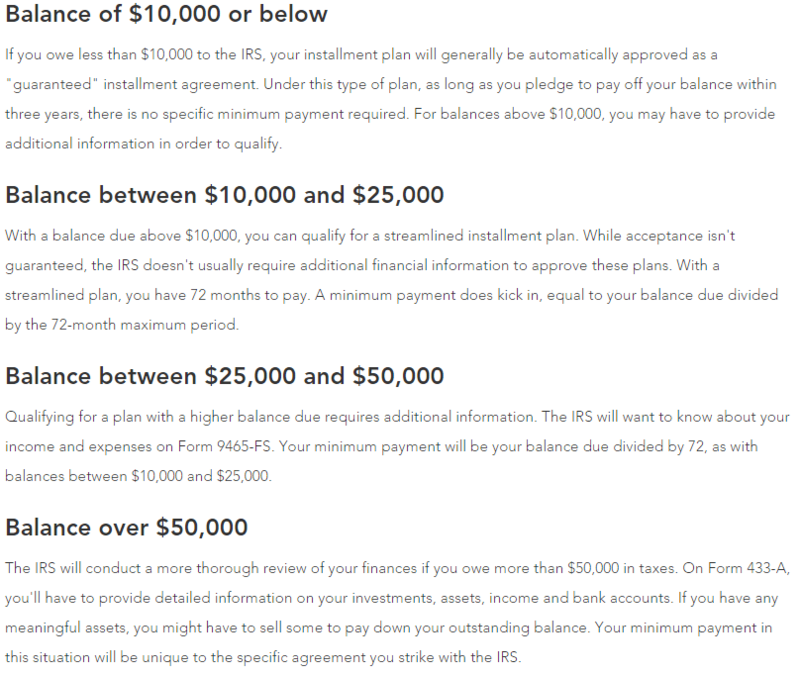 So, how do you set up a payment plan? This might sound like a no-brainer, but before applying for any payment agreement, you must file all required tax returns. If you haven’t filed yet, you can’t enter into a payment plan. If you don’t know how to file your taxes, it is best to seek the advice of an accountant. Once you’ve filed your taxes and received a tax bill, you can complete and mail Form 9465, Installment Agreement Request (PDF) and Form 433-F, Collection Information Statement (PDF) to ask for a payment plan. You can also apply online. You can’t owe more than $50,000 (or $25,000 for a business). 3. Once You Have a Plan, Make Your Payments! Just setting up a plan isn’t enough, as we will typically need to show Immigration that you’ve been paying regularly for a significant time before we apply for naturalization. You also need to understand that your future refunds will be applied to your tax debt until you’re finished paying it off. The Officer has discretion to deny your naturalization if you haven’t proven that you’re actually paying your taxes pursuant to the plan, so we typically wait a few months to gather proof of regular payments before applying for naturalization. One last thought for a client who owes back taxes and can’t afford to ever pay them off is something called an “Offer in Compromise” or “OIC.” If you can prove through supporting documents that you will never be able to pay your tax debt in full (for example due to a terminal illness or disability), the IRS may agree to accept less than is owed. The majority of OICs and undue hardship extensions are rejected, so this should be a last resort. It is always important to pay your taxes, and that is especially true if you’re an immigrant considering naturalization. When you apply, you have to prove that you’ve had good moral character for the last five years (with a few exceptions). Although there is no hard and fast rule that failure to pay one’s taxes makes you a person of bad moral character, the officer is permitted to deny your application if you owe back taxes. Once you know that you back taxes, you need to set up a payment plan if possible, as quickly as possible, and establish a history of paying your monthly payments on time and without default.